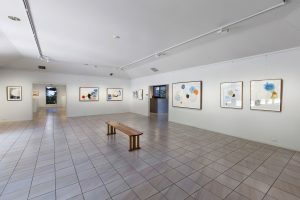 Beaver Galleries is Canberra’s largest privately owned commercial gallery, established in 1975 and owned and run by directors Martin and Susie Beaver since 1992. Located in a specially designed building in the inner south suburb of Deakin, the gallery reflects the national outlook of its home city exhibiting the work of both established and emerging artists from around the country. The gallery has built a national presence over many years, with a dynamic exhibition programme and regular participation in Australian art fairs, promoting exciting new work by renowned and emerging Australian artists. Three spacious galleries, plus a dedicated print room, feature outstanding work by contemporary Australian artists in a range of disciplines including painting, printmaking, sculpture, ceramics and glass. Also in the gallery complex is a courtyard sculpture garden, a gallery shop with beautifully crafted products by leading Australian designer/makers, and a licensed cafe run by creative young chef David Lockwood. Beaver Galleries is Canberra’s only member of Art Galleries Association of Australia (AGAA), the peak body for commercial art galleries ensuring professional excellence among members, promoting ethical practice and supporting contemporary artists. The exhibition galleries, gallery shop and cafe are open Tuesday to Sunday 10am – 5pm, located at 81 Denison Street, Deakin, ACT (300 metres past the Royal Australian Mint). There is ample free parking, and buses travel to and from the city centre along Denison Street at regular intervals. Three large gallery spaces feature work by emerging, mid-career and established Australian artists working in a wide range of mediums. Two of the spaces are given over exclusively to the exhibition programme with more than twenty exhibitions each year. The third gallery features a regularly changing display of current work by all of the gallery artists, with more work held in the gallery store room that can be viewed on request. Beaver Galleries has clients throughout Australia and overseas. Coordination of artwork delivery, through a variety of transport options, is available and can be arranged by the gallery. 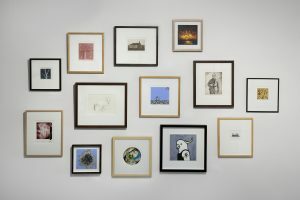 The gallery has a dedicated print room displaying and selling original limited edition fine art prints created by some of Australia’s most recognised printmakers. The selection covers all forms of printmaking from etchings and lithographs to wood engravings and linocuts. Gallery staff can assist you in the selection of both framed and unframed artworks. Beaver Galleries works exclusively with professional framers, providing experienced advice in the selection of frames for unframed prints. High quality Australian timber and archival quality materials are always used. The gallery shop features carefully selected, exquisitely crafted and individually made objects from some of Australia’s leading designers and makers perfect for a special gift, a corporate presentation or simply to take home and enjoy. 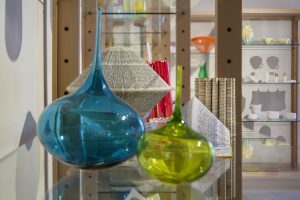 Hand blown glass vessels and objects, porcelain and stoneware bowls and cups, hand woven and silk scarves, Australian timber boxes and superb contemporary silver and gold jewellery are just some of the extensive range of work available in the gallery shop. Beaver Galleries offers gift vouchers and a gift registry service for both the gallery and the gallery shop. Gift vouchers to any value can be purchased and are valid for twelve months and a gift registry service is also available. Please contact the gallery for more information on this service. The fully licensed cafe, run by innovative young chef David Lockwood, offers both indoor and courtyard dining. 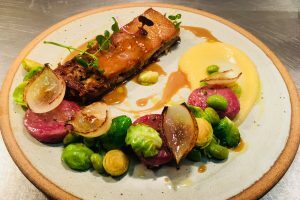 theKitchen presents a vibrant and creative all-day menu with an emphasis on seasonal, organic and sustainable produce along with a selective wine list focusing on local wineries. Superb house made cakes and pastries are perfectly accompanied by coffee using artisan wood-fired roasted beans. The unique atmosphere and innovative cuisine has made the cafe one of Canberra’s popular meeting spots. theKitchen is ideal for spending some time after wandering through the gallery, enjoying a leisurely brunch, a quick bite, a special celebration, or just coffee to go. Lunch bookings are recommended.